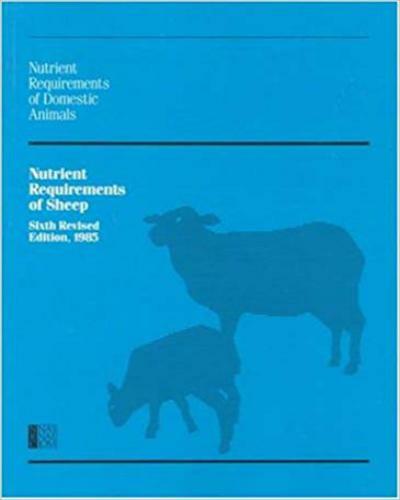 Nutrient Requirements of Sheep, Nutrient Requirements of Domestic Animals. Each of these popular handbooks contains comprehensive information on the nutritional needs of domestic animals and includes extensive tabular data. Energy. Insufficient energy limits performance of sheep probably more than any other nutritional deficiency. An energy deficiency may result from inadequate amounts of feed or from feeds (generally forages) that do not contain enough protein to sufficiently “unlock” the energy in the feedstuff. The major sources of energy for sheep are hay, pasture, silage, and grains. Milo, barley, corn, oats, and wheat also can be used to raise the energy level of the diet when necessary. Energy deficiencies can cause reduced growth rate, loss of weight, reduced fertility, lowered milk production, and reduced wool quantity and quality. Protein. In sheep rations, the amount of protein is much more important than quality of protein. However, since the sheep is a ruminant, mature sheep use effectively the naturally occurring protein and non protein nitrogen (urea) in their diets. Common sources of natural protein supplements include cottonseed, soybean, sunflower, linseed, and peanut meals. These oilseed meals contain from 40 to 50 percent protein and are excellent sources of supplemental protein. High-quality legume hays can contain from 12 to 20 percent protein and provide adequate protein for most classes of sheep when fed as a complete ration. Grains, however, are low in protein. They generally contain only 8 to 11 percent protein. Additional protein is necessary in high-grain, lamb-finishing rations for maximum performance. Non protein nitrogen sources should not be fed to young lambs. Young lambs are not functioning ruminants until they are approximately 2 months old, depending upon how soon they have access to grain and forage. However, mature sheep can be fed low levels of non protein nitrogen. In general, supplemental non protein nitrogen is beneficial only when adequate energy is available. Urea should never make up more than one-third of the ruminally degradable protein in the diet. Additionally, non protein nitrogen sources should not be used when lambs are limit-fed. Urea can be toxic if consumed in large amounts over a short time, especially when the diet lacks ruminally available energy. Furthermore, urea is very unpalatable.